Doral Golf Resort and Spa, located in the heart of Miami, sits on 650 acres of reclaimed swampland. The legendary resort offers deluxe accommodations, five championship golf courses, and a luxurious full spa. The resort has hosted a PGA golf championship since 1962 and has been a favorite of Hollywood celebrities and entertainers for almost half a century. 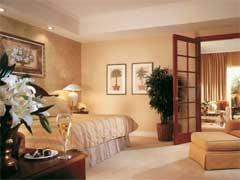 The Doral Golf Resort and Spa features 693 guest rooms and suites, all decorated to exude warmth and comfort. All accommodations include air conditioning, a spacious balcony or patio, computer dataports and high-speed Internet access, a hair dryer, cable TV, an in-room safe, and a battery recharger for camera or laptop batteries. 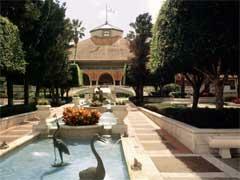 The European Spa at Doral is designed to resemble a Roman garden. The facility offers over 100 different spa treatments and features 52 spa treatment rooms. Among the offerings are a traditional Swedish massage, a couples massage, a massage sampler, a variety of facials, and the "Doral Aroma Transformation." The spa features its own fitness facility as well as a staff of nutrition and fitness experts. The spa also includes a whirlpool, hot tub, cold plunge pool, steam room, sauna, and private sun deck. The spa's indoor pool is beautifully landscaped with cascading waterfalls and hosts complimentary water aerobics classes throughout the day. The restaurant at the Doral spa features a variety of healthy, yet delicious offerings. Doral features five 18-hole championship golf courses, including the legendary "Blue Monster" and the Greg Norman-designed "Great White" course. The resort offers something for golfers of all skill levels as well as a golf school, pro shop, and driving range. The Arthur Ashe Tennis Center at Doral features 11 courts with a variety of surfaces, in a tropical setting. The center's facilities include a resident professional, a tennis school, a pro shop, and a 24-hour restringing service. Other facilities at the resort include the "Blue Lagoon" aquatic recreation area, a tropical themed waterpark with multiple slides, a Jacuzzi, and multiple pool areas. Twenty poolside cabanas are scattered throughout the park. Guests can also take advantage of fishing in one of Doral's 40 lakes and kids will love the activities at the "Camp Doral" kids center. Windows on the Green - Located on the 18th green of the "Blue Monster" golf course, this elegant eatery offered Continental cuisine with a sweeping view of the course through floor-to-ceiling windows. Bungalou's Bar and Grill - Overlooking the "Blue Lagoon" aquatic area, this casual restaurant serves a variety of Caribbean specialties, smoothies, and island-inspired cocktails. Atrium - The spa's restaurant serves elegantly displayed, tasty, and healthy cuisine. Guests can eat in their robes. Champions Sports Bar - Located near the "Blue Monster" golf course, this casual bar and grill serves sandwiches and light entrees and offers outdoor seating and a full cigar selection. The Doral Golf Resort and Spa is conveniently located just seven miles from Miami International Airport. The resort is also within a short drive of south Florida beaches, Miami Beach, and the Florida Keys. The resort offers a variety of spa, golf, and tennis packages. 4400 N. W. 87th St.